2015 National Poetry Month Celebration Has Begun! Welcome to the 2015 National Poetry Month blog tour and celebration. This year’s theme is The Search for New Perspective. I’d love to have guests talk about how poetry changed their perspective about something, even if it is just one poem, or how you think poetry can change perspective to not only reach more readers but leave a lasting impression. For those of you who already have poetry posts planned for the month or who put one up anytime during the month of April, please add your full URL to the post below, so we can all stop by and celebrate poetry with you! 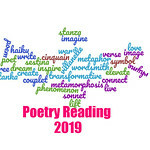 If you want grab the image and link to this post on your own blog to ensure others find all the great poetry posts we are putting up this month. In addition to these posts and the others I have planned this month; Short Story Friday will morph into Haiku Friday for the month. Haiku is one of the most important form of traditional Japanese poetry. Haiku is, today, a 17-syllable verse form consisting of three metrical units of 5, 7, and 5 syllables. I hope that you’ll share some of your favorite Haiku, write a haiku, and check out the Haiku I’ll be writing this month — the goal for me is 30 haiku poems! My last for the month & a collection of Norse gods & heroes to finish on. Thanks for sharing in the celebration. You’ve got great topics this month. Went Japanese this time, hoping to fit in Scandinavian folklore next. I cannot wait to check these out. Thanks for adding Alphabet Soup the link-up! Happy Poetry Month! Hi, Loving this Poetry Celebration, This post is the 20th Century French Poems. I love that people are participating with a wide variety of posts! Thanks for adding that link to the information about Haiku! Thanks for organizing us! I decided to start with a poem early this month, since I haven’t had as much on the blog lately, and I’ll probably find another poem–or a whole volume–before the end o the month. Thank you for hosting this, Serena! As you know, I will be reading and reviewing The Robot Scientist’s Daughter this month. I cannot wait to see your review. Thanks, Melanie. I have guest bloggers visiting Author Amok ever M, W, F this month. Our theme is: What are you wearing? Poetry about clothing. That sounds fantastic. Who’s Melanie?